Inner peace continues to elude a rather large number of seekers despite their having invested a lot in terms of time and money experimenting with at least a couple, if not more, of the new-age techniques/therapies known to us humans today. 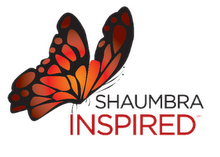 My own experience was that while the therapies often produced amazing results for others, nothing seemed to work for a few personal issues where I was rather desperate to ‘create’ the results that I wanted. I was obviously confused, angry and a bit frustrated because I did not know what more I should be doing. There was this knowingness too that when I should have been living in the Light, it was darkness that still surrounded me. Mind you, not in all but a few areas in life where there was a bit of emotional investment in the results! I came across some knowledge by chance that sounded rather controversial initially. The earlier approach was to get rid of the darkness through Reiki / Crystal healing as this had served me very well in other areas in life. The recommended new way of being was to stop fighting the darkness but to accept it and in fact to stop doing Reiki for these issues. By that time, I was already rather tired of fighting the darkness and so did not have too much of a problem taking this on. After the initial hiccups I discovered much to my delight that by accepting the darkness, the burden actually felt less. Slowly but surely, tiny bits of light started appearing on areas that had been rather dark. Things started to change. Just to share one such issue: I have had the tendency to gain weight rather too easily all my life. Getting the excess off has always been a losing battle. I discovered that by transforming my core-beliefs of fighting this weight, being overweight stopped being an issue. Since then, the excess has been coming off rather easily and effortlessly over time. Likewise, abundance was also a big issue as it is with most spiritual seekers. No more now! If this story is somewhat familiar, then maybe it is time for you too to stop relying on some external technique or therapy to ‘fix’ the problem but start transforming on your core-beliefs. You will then be able to create the magic yourself instead of some external energy doing it for you. I am talking here about Prayers, Positive Affirmations, Reiki etc. You too can start getting results in your dead-end areas in life. The transformation of the existing belief system transforms the way of being of the human being. Everything in life then starts to fall in place. It might appear to be slow initially but there is a definite shift. Over time, a whole new level of synchronicity happens in everything in life. A good place to begin this process of transformation is to identify the cycles that you are personally caught up in. This will then help in reprogramming the reactions, or rather the programmed way of dealing with the Darkness that is there in life. This is part of the core level transformation, one aspect of which is discussed in this short piece. My Game of Life i.e. the Marathon Golfer was declared on 13 Feb 2014 during Session 8 of the Money Seminar. 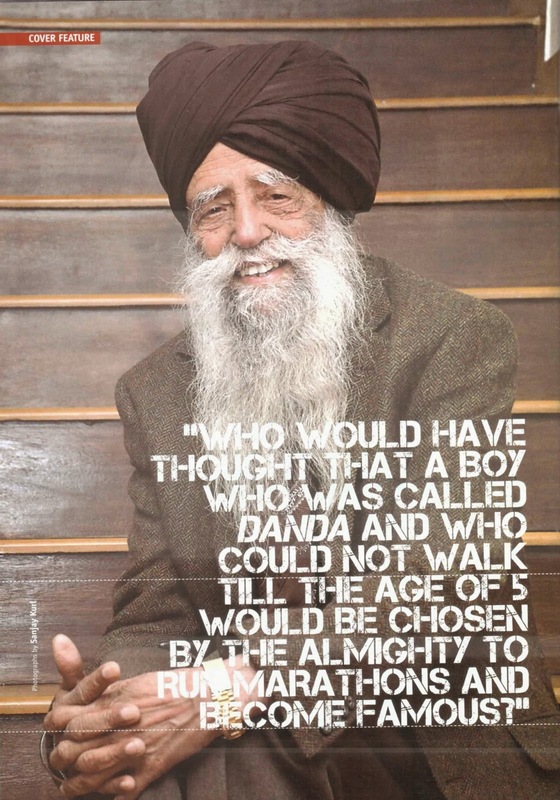 This obviously is dedicated to Mr. Fauja Singh. The name is not one that I created from the mind - it just popped up. This was more than a year after my first visit to a local Golf Academy (on 5/1/2013); a period of time during which my game did not really move forward. One of the obstacles was the sudden realization that I was not really a man of action, a possibility that got created on 18/12/2013 during one session of Landmark that I just 'happened' to be attending. This creation saw me starting a routine of physical workouts which is now a part of my way of being. I am now a man of action when I choose to be. Not much activity however happened on the Golf front even after the game called Marathon Golfer was declared. There were concerns about not having appropriate training facilities like being able to hit shots off the turf without going to the Course. The academy that I was going to did not have any such arrangements and I had kind of got bored with hitting balls off the mat. And the coaching that was available was also nothing much to write about. Still the possibility that had already been declared was working overtime and I 'happened' to hear about another academy located about 20 kms from home and paid a visit on 21 July, 2014. One visit and I was hooked as it does have everything that anyone could possibly need for learning and working on the game. There is a 9-hole challenging course right next door. I took my first coaching session from Mr. Sunil Kumar on 20 Aug, 2014 and it's a process that is ongoing. He is really a good coach and a good human being too. There have been visits in between to the 9-hole golf course during which I have played rounds in 100, 75, 70 and 66 shots which I know, is nothing much to write about. But the fact remains that my game is improving on all aspects. I am getting better with each and every day that passes. Now these possibilities really enliven me and in fact are driving me on and on. The benefits are already there for me to see. I am fitter than ever. The tremors in my hands have considerably reduced. I have lost a few pounds and inches around my waist and thighs. My body is getting leaner. The knees and shoulders are absolutely fine. And more important, there is a sense of purpose in life. A life that is in any case Empty and Meaningless. These clippings are about people I really look up to. In the sense, I have always wondered how these guys could achieve what they have done in their lives. I am really inspired by what the first two individuals have achieved at the physical level. To be performing at their age - It Is Just Amazing! 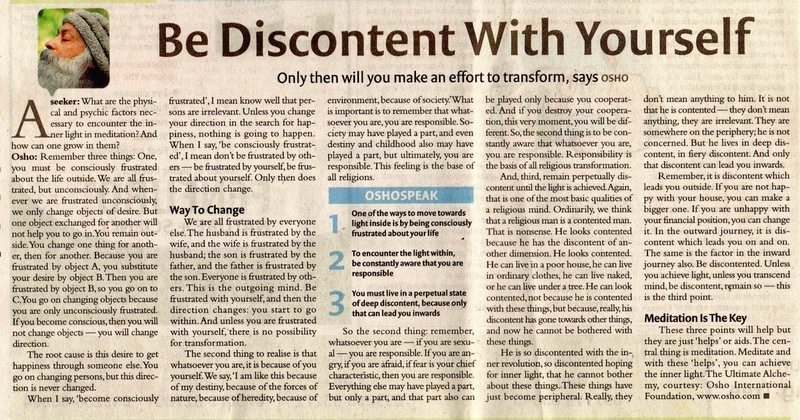 The views as expressed by Osho about Being Discontent resonated strongly with my inner world when I first read this article. In that moment, I realized that my life has been one of Discontent at the core level, but somehow I could not figure out why? In that moment, I understood the reason for my being on earth this time around was to figure out how Mr. Fauja Singh and Mr. Hidekichi Miyazaki have been able to achieve what they have. There are others, I am sure, who have not been written about. 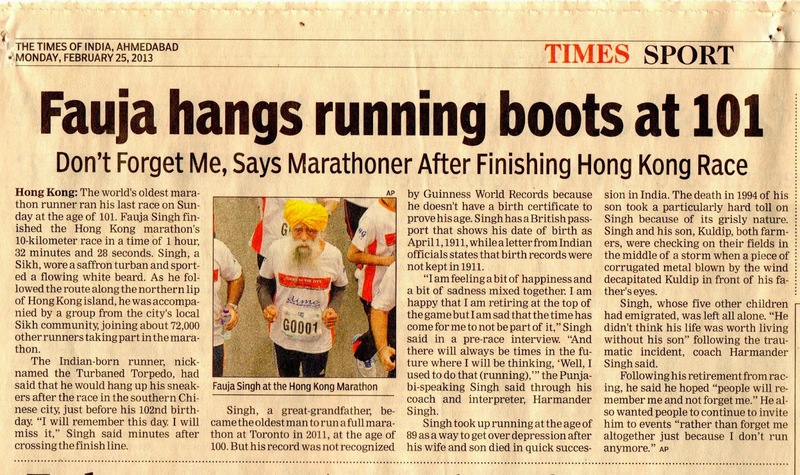 Mr. Fauja Singh gives total credit for his success to the Almighty and therefore, unfortunately can not teach others how he has been able to do what he has done in his life. Being not so blessed, I sure would like to figure it out for myself. This is what my life has been about, especially over the last two decades at least. I think I have largely understood how this can be achieved. The game of Golf is my medium of self-expression. I really do not know whether I have chosen the game or the game has chosen me. It was suddenly there in my life in January 2013. More about it in the next post. To be able to achieve something similar at the age of 100+ would be something really awesome. Till then I will be Discontent. The widely understood and accepted mode of ‘creating’ something new is to begin from what you Have (from the past), take some Actions (in the present) in order to ‘Create’ something or Become someone (in the future). This apparently is the logical way of being i.e. living a life that moves forward from the past towards the future. But is it a really satisfying and fulfilling way of being and more important, is this the only way to be? What if we were meant to live the present moments from a Future already Created? Sounds crazy, right? Believe me, it is not. It sounds absurd because it is totally counter-intuitive. But this way of being is really worth experimenting, I wish to add. Living a Life from the Future is the essence of the technology that is being ‘shared’ by Landmark Worldwide (formerly known as Landmark Education). I have deliberately used the word ‘shared’ as the word teaching does not somehow seem to be appropriate. What I have discovered over the past about 15 months of being associated with Landmark Worldwide is that Living from the Future is the rational and logical way of being. I will even go to the extent of saying that this is THE way of being for the ones desirous of living moment to moment in every moment. 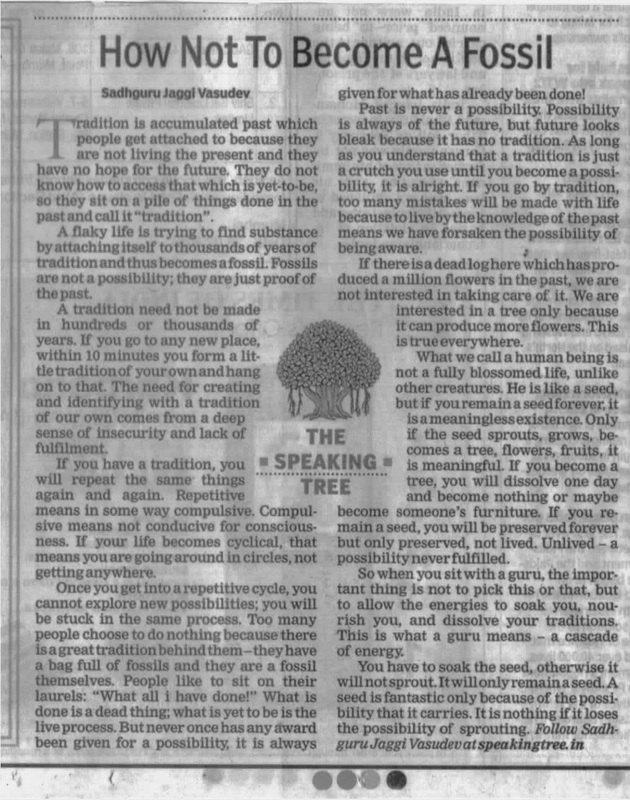 I am also of the firm belief that this was the original way of being for us human beings but seem to have lost in the process of evolution. The language and the words were pretty familiar. In Crimson Circle, the word used is 'Potentials' as in 'of the future'. In Landmark Worldwide, the word used is 'Possibilities'. Interesting stuff. Is Sadhaguru Jaggi Vasudevji a Landmark Graduate too?? Maybe and maybe not. But then that's another thing. I was feeling rather lethargic and dull when I woke up today. (Long day yesterday, late night.) Definitely not in the frame of mind to do my morning routine of workout - something that I have committed to recently under a much larger game in Life. In the normal course, I would have skipped the workout routine today. But reading this article made me realize that I would be becoming a Fossil by letting my past takeover. I would be caught in the all too familiar repetitive cycle of not-working-out-after-a-long-hard-day-yesterday. I immediately created the Possibility of Taking Actions as in 'Doing my Workout Today' and 'Not being a Fossil' today. This possibility was created in the mind, of course. A few minutes later as I was lazing around, I noticed that I had started breathing deep spontaneously. But through the mouth and not the nose. I allowed the breathing to be and after a few minutes, I was fully energized and in the now. In the few moments that followed, I had made the transition from Playing the Game in the Playground of the Mind to Playing the Game in The Physical Reality. The workout happened and the tiredness and fatigue that was the reality a little while ago had totally transformed.I was fresh and full of Life. The experience of being Alive had transformed. A small victory over the past way of being but a pretty significant one, nonetheless.